A 57-year-old male with controlled diabetes mellitus and mild hypertension, presented with tinnitus for three years (continuous, pulsatile, high pitch, synchronous with heart beating). It gets relieved occasionally after he play sports and take shower and then starts again after few hours. Vertiginous attacks for two years (lasting for 20-60 minutes), true vertigo, it was related to head movement when he turned his head to either sides, but more toward the right side, and associated with nausea, vomiting, sweating and imbalance, no change of tinnitus, no aural fullness or hearing loss during the attacks, no cardiac or neurological symptoms, no headache. Three attacks of vertigo during the first year and five attacks during the last year have been observed. The last one is the most severe one lasting for seven hours, which was two months ago and has been admitted in the hospital and was associated with hearing loss in the right ear. He claimed that his hearing loss improved after iv cephazoline. No family history of similar complaints or migraine. He mentioned that he can predict that he will have vertigo. Now, since the last vertiginous attack two months ago, no more attacks of vertigo have been observed, but still continues to have tinnitus and mild hearing loss, occasional imbalance mainly on the right side. He avoids looking quickly to right or left, instead he moves the head slowly to each side because when he turns the head quickly, he experiences vertigo. He was diagnosed of Mιniθre's disease and was started on betahistine dihydrochloride, but has shown no improvement. Tympanogram was normal. ENG was not done. Routine blood works were normal. No neck mass, no compression over right external jugular vein or thoracic inlet. In our patient, the imaging study used was CT scan with intravenous contrast and it was enough to reach the diagnosis and to see other associated anomalies that may share to cause the blood flow turbulent, and hence tinnitus was from venous origin. There are many different causes of objective pulsatile tinnitus due to venous origin like high jugular bulb or enlarged jugular foramen, which can be defined as dilated when the difference between vascular portion of jugular foramen diameter is more than two cm,  but in our patient, the difference was less than two cm; so we can rule out the jugular foramen cause. In general, emissary veins connect the internal and external venous network of the skull. Sometimes, turbulents of blood flow can cause noise (tinnitus) which may be decreased by applying pressure to area of responsible vein. Mastoid emissary vein connect suboccipital venous plexus to sigmoid sinus through mastoid foramen. Its diameter normally varies from 0.8 mm to 4.5 mm, if it is less than 0.8 mm, we will consider it as rumentery and if it is more than 4.5 mm, it will be considered as dilated. ,,, Right mastoid emissary vein diameter in our patient was about 10 mm, so we consider it as a dilated vein [Figure 1], which is the most common emissary vein that can cause objective venous plusatile tinnitus, but due to its place, applying pressure to its area was difficult to decide if we completely stopped that vein flow and then tinnitus or not. Other causes like condyler emissary vein and rarely transverse sinus stenosis. All the previous structures were normal in our patient. The communication between deep temporal and transverse sinus through post glenoid foramen that hosting postglenoid fetal vein. ,,, Its diameter was 5 mm [Figure 3]. 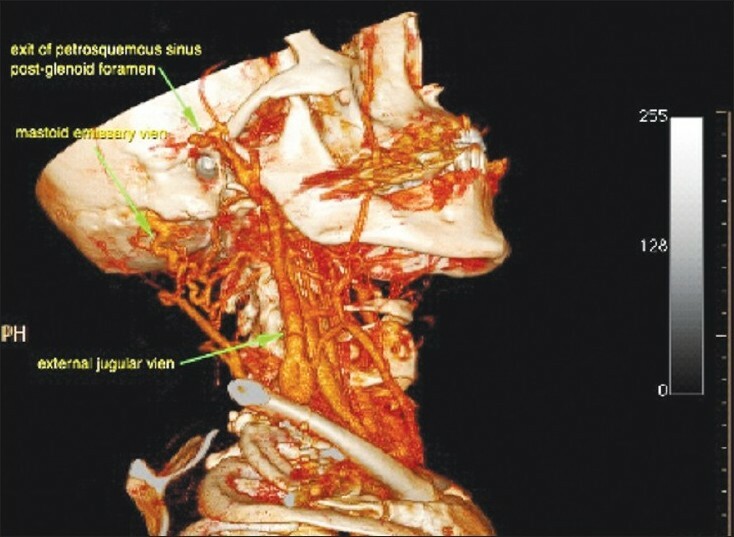 Then, continuation of temporal vein to external jugular vein which was also dilated in this patient with no abberant distal obstruction, the diameter of external jugular vein was 11.7 mm [Figure 4]. This explains the reason when applying pressure over the area of deep temporal vein or external jugular vein causes decrease in tinnitus pitch by 50% according to the patient and does not disappear completely due to the presence of mastoid emissary vein dilatation. Petro-squamosalsinus was described before CT scan based on temporal bone disecssions, , but now-a-days, CT scan give us an excellent tool to help in the diagnosis of vascular anomaly in temporal bone which is much easier and faster with detailed description of the structure. 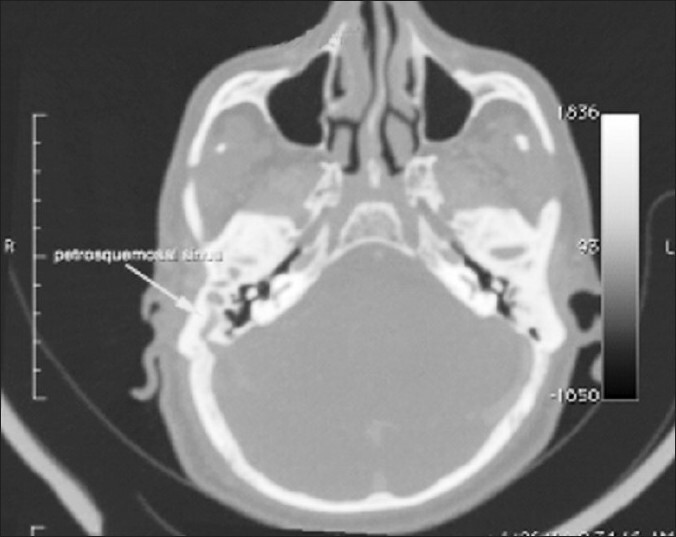 We use CT scan with contrast to help in diagnosis of this case and 3D reconstructive method was very helpful to see courses of these abnormal veins and position of gleniod foramen [Figure 4]. Both petro-squamosalsinus and dilated mastoid emissary veins were reported in two patients; one with conductive hearing loss and the other with sensorineural hearing loss. But in this case, the patient has sensorineural hearing loss, tinnitus, and vertigo which made Mιniθre's disease as one of the strong defferntial. We can't explain the presence of vertigo in this patient although it was reported before, but tinnitus presentation is first time to be reported in association with petro-squamosalsinus. The combination of presence of petro-squamosalsinus, dilated mastoid vein, dilated external jugular vein, tinnitus, vertigo, and sensorineural hearing loss is first described in our patient which was not described before in the literature. Our management was reassurance of the patient, explaining the nature of his problem, neglecting tinnitus and there is no serious disease like malignant tumor. Also, we asked him to avoid turning his head quickly to any side in order to minimize the attacks of vertigo. With the follow-up of every six months, the patient has informed us that he has been following our instructions well and that he is felling much better now with only one mild attack of vertigo over the last six months, and tinnitus is still there, but it is not annoying him anymore. Tinnitus and vertigo are annoying symptoms which need a lot of work-up to reach the proper diagnosis. Patients with petro-squamosalsinus (PSS), dilated mastoid emissay vein, and external jugular vein may be presented with vertigo, tinnitus, and hearing loss. CT scan is a very helpful tool to diagnose those patients with excellent result by reassurance when the patient has idea about his/her disease. This combination of anomalies is first time to be described in the literature. 1. Sismanis A. Pulsatile tinnitus. A 15-year experience. Am J Otol 1998;19:472-7. 2. Weismann JL. Imaging of a tinnitus: A review. Radiology 2000;216:342-9. 3. Marsot-Dupuch K. Pulsatile and nonpulsatile tinnitus: A systemic approach. Semin Ultrasound CT MR 2001;22:250-70. 4. Lambert PR, Cantrell RW. Objective tinnitus in association with an abnormal posterior condylar emissary vein. Am J Otol 1986;7:204-7. 5. Caldemeyers KS, Mathews VP, Azzarelli B, Smith RR. The jugular foramen: A review of anatomy, masses and imaging characteristics. Radiographics 1997;17:1123-39. 6. Reis CV, Deshmukh V, Zabramski JM, Crusius M, Desmukh P, Spetzler RF, et al. Anatomy of the mastoid emissary vein and venous system of the posterior neck region: Neurosurgical implications. Neurosurgery. 2007;61:193-200. 7. Boyd GI. The emissary foramina of the cranium in man and the anthropoids. J Anat 1930;65:108-21. 8. Falk D. Evolution of cranial blood drainage in hominids: Enlarged occipital/marginal sinuses and emissary foramina. Am J Phys Anthropol 1986;70:311-24. 9. Forte V, Turner A, Liu P. Objective tinnitus associated with abnormal mastoid emissary vein. J Otolaryngol 1989;18:232-5. 10. 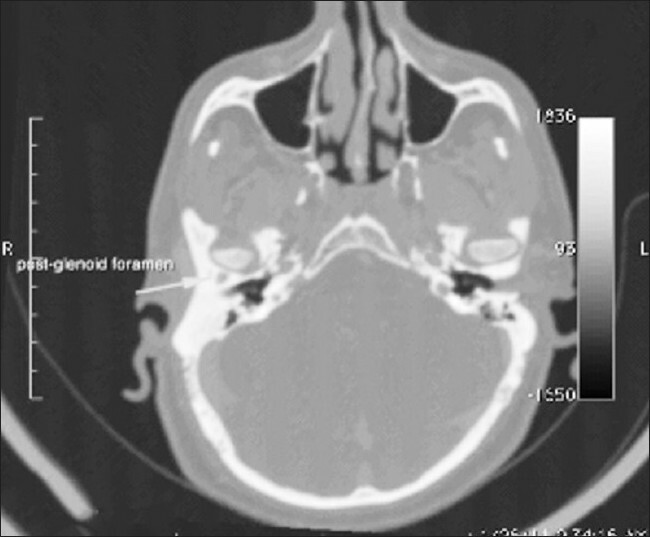 Hadeishi H, Yasui N, Suzuki A. Mastoid canal and migrated bone wax in the sigmoid sinus: Technical report. Neurosurgery 1995;36:1220-4. 11. Chell J. The squamoso-petrous sinus: A fetal remnant. J Anat 1991;175:269-71. 12. Knott JF. On the cerebral sinuses and their variations. J Anat 1881;16:27-42. 13. Butler H. The development of certain human dural venous sinuses. J Anat 1957;91, 510-526. 14. Padget DH. The cranial venous system in man in reference to development, adult configuration, and relation to the arteries. J Neurosurg 1955;12:307-55. 15. 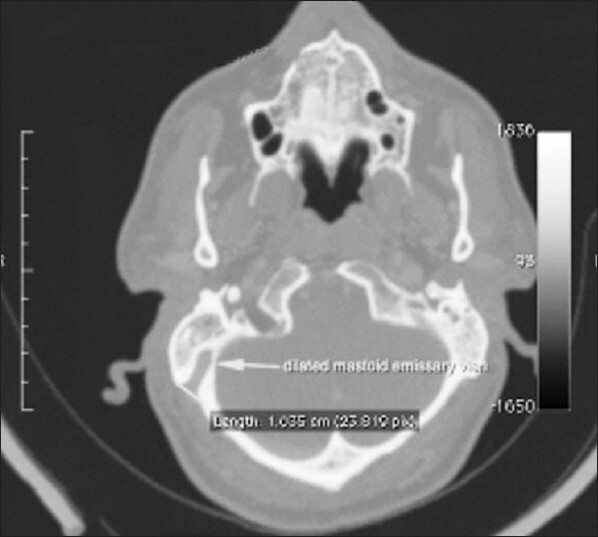 Marsot-Dupuch K, Gayet-Delacroix M, Elmaleh-Bergès M, Bonneville F, Lasjaunias P. The petrosquamosal sinus: CT and MR findings of a rare emissary vein. AJNR Am J Neuroradiol 2001;22:1186-93. 16. Jaros³aw W. Morphology of the temporal canal and postglenoid foramen with reference to the size of the jugular foramen in man and selected species of animals. Folia Morphol 2002;61:199-208. 17. Sabrina K, Petra K, Thomas S. Vascular anomalies, sutures and small canals of the temporal bone on axial CT. Eur J Radiol 2005;54:335-43. 18. Cheatle. Mastoid Emissary Vein and its Surgical Importance. Anatomy Section of Otology; 1925. p. 29-34.